7A, 3 in 1 Klixon Circuit Breaker. P/N D6760-17-7. 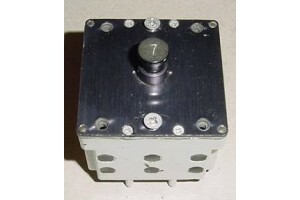 7A Klixon Circuit Breaker. P/N D6760-17-7 or BAC-C18L-7A. Alternate P/Ns D6760-17-7-1/2, 6760-17-7 1/2, 00-415-6106. NSN: 5925-00-415-6106. It measures 2 3/16" by 2 3/16" by 2 1/8". It was removed from a salvage aircraft.